Jamie Hamilton’s interdisciplinary work arises from curiosity about the limits of the body, knowledge and materials. His sculptures function as philosophical machines that pursue balance in precarious circumstances. I love building. 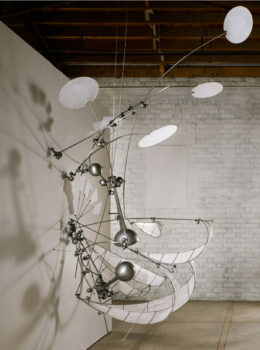 I’ve always been drawn to structures, tools, and machines and to the physics, process and thinking that creates them. These interests flow and ripple into my work. This and the methods I observe in the world of fabrication and invention are incorporated into my process, yielding sculptures that I believe function as philosophical machines. I work as an inventor, discovering solutions to the problems of dream, fear, and death. The practice of art allows me to destroy, renew, change and expand my opinions and my identity. If granted funding I would use the SPREAD grant to acquire optic materials such as dichroic and two way glass, prism stock, and lenses. The money will also help with the costs of machining parts, replacing consumables used in production, and allow time to explore new forms. I would use the funds to produce a new body of work based upon the notion that we are simultaneously shaping and shaped by our instruments of seeing. To learn more about Jamie Hamilton click here.